With removable weighing bowl for easy cleaning and large dial. Container Size 6.5" x 5" x 2.5"
Scale Size 6.5" x 5.25" x 9.25"
Large Dual Reading Dial Doesn't it get on your nerves when one recipe calls for ingredients in grams and the next recipe calls for ingredients in ounces? Well with this kitchen scale, that won't be a problem. 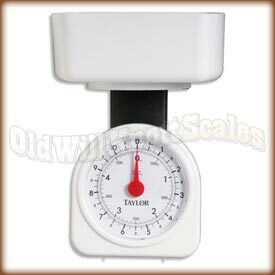 The dual reading dial on the Taylor 3719 displays your weights in both grams and ounces simultaneously...you'll never have to worry about switching back and forth between units again. Compact Storage When you're not using this mechanical kitchen scale you can store it inside its weighing bowl to keep it out of the way. Zero Adjust Knob Use this knob to make sure you start weighing at zero every time. 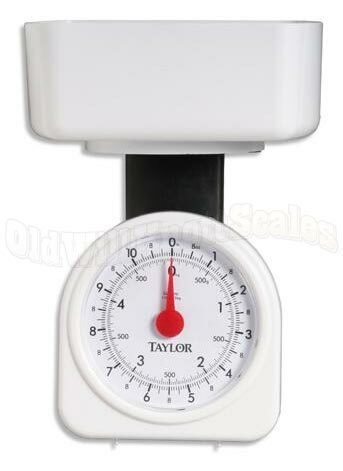 I'm sorry, but unfortunately there aren't any spare parts for these scales. Thanks for the question!